Steve Faber, Heather Jones and Dave Redfern; Club Supervisors. Like Oprah, I too have a list of my favourite things. The only difference is, I can't give away a million dollars worth of product to everyone at the school; but what I can do, is share a life long passion of mine with students. That passion is "Fly Fishing", a sport that requires skill, patience, stealth and knowledge. Seven years ago I got together with fellow angler and teacher Heather Jones and after a short discussion; the Northwestern Fly Fishing Club was born. I have been an avid trout fisherman for over 30 years and like a kid in a candy store, I can't wait for each club fly tying session or fishing trip. We are very fortunate to have Heather Jones, "Fly Fisher Extraordinaire", bring a wealth of knowledge, skill and enthusiasm to the club. 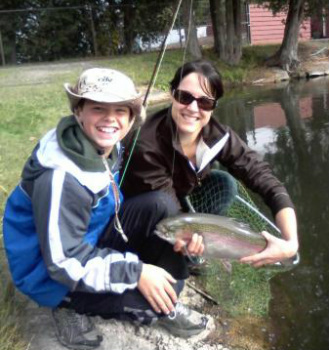 Heather has been fly fishing since she was a young girl and possesses extensive knowledge in the art of casting, migratory and feeding habits of trout, stream etiquette and (insect) entomology. Through her connections at "Friends of the Grand" we received a donation of ten, 5wt and 6wt Sage rod and reel combos of substantial value. Canadian Tire also helped out with a discount on 10 sets of various sized chest waders. carefully the sections on eligibility, conditions and club rules, so there are no misunderstandings. You may also download a PDF copy for your own benefit and records. 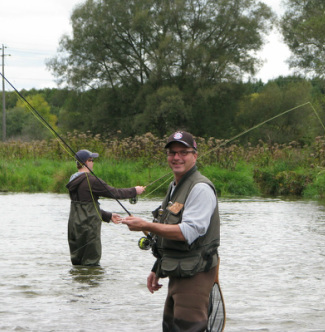 Another smiley face and a first Ontario steelhead! Mr. Redfern started fly fishing when he was 12 and living in Kamloops, B.C. Soon after learning to fly fish he took up fly tying and quickly developed enough skill to start a small fly tying business. While 14 to 15 years of age, Mr Redfern would fill fly orders by the dozens for lodges around the Kamloops area. Moving to Vancouver, Mr. Redfern then began to target salmon in the local rivers. Fishing for a Chinook, Pink, Chum and Coho salmon gave Mr Redfern an opportunity to catch a wide variety of fish and learn which flies would entice different fish to bite. Now living in Stratford, Mr Redfern is anxious to learn the patterns and techniques that produce fish in Southwestern Ontario.